As most of you already know, ViralinBox comes with a built-in System Mailer. If you’re a Platinum or Diamond Member, you will receive respectively 1,000 and 2,000 Mailing Credits every day. As a Silver or Gold Member you won’t receive any Mailing Credits on a daily basis but you can earn some by reading Reward Mails and visiting advertised pages. This means that you will get FREE exposure by simply using ViralinBox! As a Silver Member you will receive 1 Mailing Credit every time you watch an advertised page in your Reward Mailbox for 10 seconds, as a Gold Member 2, as a Platinum Member 3 and as a Diamond Member 4, which means that even if you are a Platinum or Diamond, it is really worth reading your Reward Mails as you can receive up to 4 Mailing Credits every time you watch an advertised page for 10 seconds. You can also earn Mailing Credits for watching a recommended members page for 30 seconds. As a Silver Member you will earn 3 Mailing Credits, as a Gold Member 6, as a Platinum Member 9 and as a Diamond Member 12. Just for viewing an advertised page and recommended page (40 seconds of your time), you can earn 4 Mailing Credits as a Silver Member, and all the way up to 16 as a Diamond Member. So imagine being able to send your offer to 4 unique people for less than one minute of your time! If you’re a Silver Member this is a fantastic way for you to get FREE exposure for your offers, and if you want to earn even more Mailing Credits make sure you upgrade to Platinum or Diamond! To upgrade simply log into your account and go to the ‘Upgrade’ Section (in the ViB Menu on the right of your dashboard). Video – How to Earn Mailing Credits (MUST-WATCH! As you earn Mailing Credits, you can email random members using the ViralinBox System Mailer. Imagine you just read your Reward Mails and visited a few advertised pages… You earned 50 Mailing Credits, and can immediately use them to email your own offer to other ViralinBox Members. To use the ViralinBox System Mailer, simply log into your account and go to the ‘Mailer’ Section (in the ViB Menu on the right of your dashboard). This will direct you to the System Mailer page. At the top you will be able to see how many members you can email at once. As a Silver Member you can email up to 250 members as a time, as a Gold Member 500, as a Platinum Member 2,000 and as a Diamond Member 4,000 plus the number of people in your downline. Make sure you read the on-screen instructions BEFORE you hit the ‘Send Email’ button. A scheduled email CANNOT be canceled. You can choose to send the email using a generic ViralinBox email address or a personal one. You can also choose to send the email to your downline members only or to random members. In the second case if you want to send the email to additional random members, you MUST enter a number in the ‘Randomly Selected ViralinBox.com Members’ field. 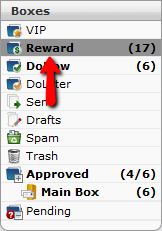 Remember: If you want to earn Mailing Credits, make sure you check out your Reward Mailbox every day! This is a fantastic deal even if you’re a Silver Member! However if you want to earn even more Mailing Credits, then make sure upgrade to Platinum or Diamond! To upgrade simply log into your account and go to the ‘Upgrade’ Section (in the ViB Menu on the right of your dashboard).